Wrench on cars long enough, and you’ll learn not only the “right way” and the “wrong way” to get a job done, but also a path in the middle—one that means getting the car back on the road, even if the fix isn’t exactly pretty. I took that middle path yesterday after my friend showed me her car’s rusted-out radiator support. The result may make you cringe. So much salt gets dropped on roads in Southeast Michigan that the entire crossmember holding up my friend’s Buick’s radiator turned to Fe2O3, forcing me to conduct a repair I’m not exactly proud of. So for those of you keen to learn the proper way to wrench: it may be best if you don’t continue reading. “Oh, that’s just an air dam, it’ll be fine,” I thought. But then yesterday, Nicole stopped by, and I quickly realized that— even though it wasn’t an entire bumper hanging off the front of her 2003 Buick Regal—it was still an important structural element: the lower radiator support. That radiator support is a part of the W-body GM’s unibody (it’s actually spot welded to the chassis, not bolted on), and it serves two functions: it gives the plastic air dam a place to bolt to, and—crucially—it holds the entire cooling module—the radiator, condenser and both cooling fans—in place. An image of the Buick on jack stands after the fix. The Buick barely fit into my garage (somehow, it’s 10 inches longer than my giant Grand Wagoneer), but once it was in, we threw it up on jack stands to have a closer look. What we found was that much of the cross member, which is shaped like a “U” (with the flat bottom of the “U” containing two rubber grommets to hold up the cooling module and the sides of the “U” reaching up to the unibody to which they are welded) had rotted into nothingness. The rusty radiator support was barely holding onto the unibody on the passenger’s side. 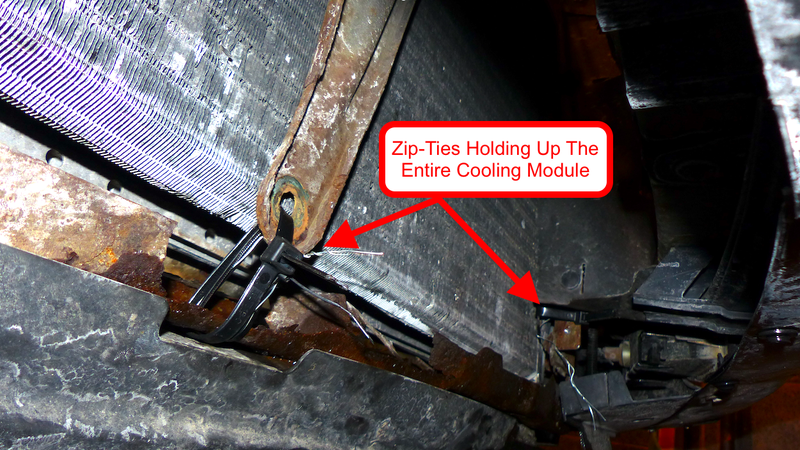 That little bit of perforated metal on one side—along with the tension in the electric fan wires, as well as the transmission, radiator and condenser hoses and lines—was the only thing keeping the entire cooling module from falling through the bottom of Nicole’s Buick. The proper solution to this problem would have been to either build a radiator support out of sheet metal, or to buy a new one online. In either case, the repair would have required some welding and cutting (though, if I’d had more time, I’d likely have used rivets or self-tapping screws). If Nicole taken it to any shop, this was definitely not going to be cheap. Which is why Nicole took the Buick to me; for a car that’s only worth about $2,000 at best, spending heavy coin on repair work at a dealer is a hard pill to swallow. For her old Buick, she was just looking for a janky, but cheap, quick, safe and effective way to just get the car back on the road. After breaking some standard-size zip-ties, Nicole and I made a run to Harbor Freight, and picked up some heavy-duty ones, along with some metal safety-wire just in case (I was a bit concerned about the sheetmetal potentially shearing the zip-ties, so I used steel wire as a backup). After tying the center of the crusty radiator support to the hood latch bracket, we now had the crossmember held up on one side by very thin metal that was on the verge of breaking, and also in the center. Obviously, fastening a cooling module by using zip-ties to hold up a crossmember that’s actively rotting isn’t the best solution, even though the back side of the member (towards the rear of the car) still had a bit of stiffness to it. So as a safety, I drilled a hole into a part of the car’s unibody, sent a zip-tie and safety wire through it, and fastened them to the little bracket bolted to the cooling module shown below. That way, even if the crossmember below gives way due to rust, at least the cooling module will be held up by something. And here’s the final result; the crossmember is held firmly in place, and even the radiator posts now sit snugly into the grommets in the upper radiator support. It’s an ugly fix, and not one that I’m proud of, but it’s one that I’m sure will last for years—perhaps even the lifetime of the car. There are times when spending money on a “by the book” fix doesn’t make sense, and you really just need a quick and dirty solution that works. When those times come, you just have to be sure to use good judgement and often times, some damn fine zip-ties.